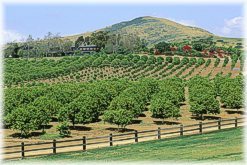 Rancho Santa Fe is located 30 miles north of San Diego and just a few mile s east of Solana Beach and Del Mar. It's popularly called "The Ranch" and is one of the world's most prestigious communities. The Robb Report recently rated Rancho Santa Fe as the top place in the U.S. for the affluent to live. The Rancho Santa Fe Zip Codes are 92067 and 92091. Search MLS data for Rancho Santa Fe real estate & Rancho Santa Fe homes for sale. Originally American Indian country, Rancho Santa Fe was part of the Rancho San Dieguito land grant that ended up in the hands of Juan Maria Osuna in 1836. Between 1906 and 1917, the Santa Fe Railway purchased the holdings that made up the original San Dieguito grant. Their idea was to plant 4,000 acres with 3,000,000 eucalyptus tree seedlings to be used for railroad ties. The project failed when it was found that eucalyptus would not hold the railroad spikes. Flooding in the San Dieguito Valley was controlled when the Lake Hodges Dam was built in 1917, opening the area for orchards and residential development. 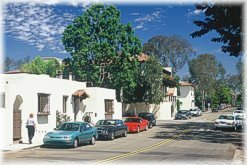 The name was changed to Rancho Santa Fe in 1920 and the new community started being developed. In 1927 the Rancho Santa Fe Association was formed and the Protective Covenant was recorded in 1928 to ensure orderly development of the area. "The Ranch" is truly the land of the rich and famous. Celebrities and notables find privacy in luxurious Rancho Santa Fe homes set in the seclusion of rolling hills and canyons. Residents enjoy spectacular views overlooking thousands of eucalyptus trees. Horses are a major hobby in "The Ranch" and the Rancho Riding Club offers complete facilities for Association members and their guests. 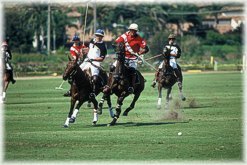 Riders enjoy 36 miles of well-maintained equestrian trails that meander through Rancho Santa Fe real estate. 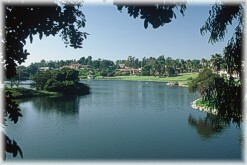 The Rancho Santa Fe Golf Club is one of six private golf courses in Rancho Santa Fe, costing up to $300,000 to join. Nestled in the heart of the historic "Covenant," it's regarded as one of the premier golf venues in the western United States. The adjacent Rancho Santa Fe Tennis Club boasts a 3,100 square foot tennis clubhouse and twelve tennis courts, including two carpeted courts and two clay courts. Search MLS data for Rancho Santa Fe real estate & Rancho Santa Fe homes for sale. Be sure to stop at "The Village," located in the heart of Rancho Santa Fe. There you'll find a distinctive array of specialty retail stores, award-winning gourmet restaurants and numerous real estate offices. Also, you'll enjoy the venerable and historic Inn at Rancho Santa Fe, with its sprawling lawn and comfortable lounge. It's a perfect get-away, very intimate, quiet and private. Several premier award-winning restaurants such as Mille Fleurs offer world-class dining. Some find Rancho Santa Fe to be reminiscent of the Montecito area of Santa Barbara with many large Mediterranean-style homes on large parcels of land. Privacy is the key here with home sites averaging several acres in size. In the last six months there were 125 sales of $1 million+ Rancho Santa Fe Homes, making it truly a haven for those who can afford the very best. Buyers will often pay more than $1 million just for a prime vacant home site to build a custom home. With the shortage of buildable lots, older historic ranch-style homes are being razed and replaced by large custom homes that meet strict architectural review. Most Rancho Santa Fe homes have gated entries, swimming pools and tennis courts. The Rancho Santa Fe lifestyle is preserved by an association that vigorously enforces the protective covenants and strict architectural review of new construction and remodels. Just south of Rancho Santa Fe lies Fairbanks Ranch. Developed in the mid 1980s, it was originally the ranch of Douglas Fairbanks Jr. and Mary Pickford. A spectacular opening took place during the Los Angeles Olympics of 1984. This private gated community stands on rolling hills surrounded by breathtaking Southern California landscape. With its own village center and schools, Fairbanks Ranch offers the ultimate in large, custom homes in a more traditional neighborhood setting than Rancho Santa Fe. The residents here are younger and many private schools and distinguished churches are the pride of this storybook area. Search MLS data for Rancho Santa Fe real estate & Rancho Santa Fe homes for sale. The small, exclusive Rancho Santa Fe School District is one of the best in the state. It provides a world-class education for K-8 and is a big attraction for families with small children. Children are also served by the Solana Beach School District and the well-respected San Dieguito Union High School District. See more information below on Aviara schools or go to School Reports. If you want to buy a home in Rancho Santa Fe or if you already own a home in Rancho Santa Fe, protect your investment by looking at Real Estate Statistics. There, you can track the average sales price, days on the market, sale to list price ratios and more. Included are vital statistics, charts and graphs on Rancho Santa Fe real estate, shown on a monthly and annual basis. And, be sure to sign up for the free e-mail reports on Ra ncho Santa Fe real estate trends by going to Real Estate Trends. Want more information on Rancho Santa Fe real estate and homes for sale? Click here to contact Neal Hribar, your Rancho Santa Fe real estate agent. What homes are currently for sale in Rancho Santa Fe? Click here to do an instan t search of Rancho Santa Fe real estate for sale.